Growing up there were 2 salads we made at home: this refreshing tomatoes and cucumbers salad and garlic filled tzatziki. As a kid I did not like both of them – I was more focused on chicken and pizza, salads were for old people. Now that I’m old(er) and wiser I know there’s nothing better than tzatziki. I’m pretty sure this fresh, fragrant, tangy little Greek dish was invented by one of the Greek gods. It gets everyone addicted. 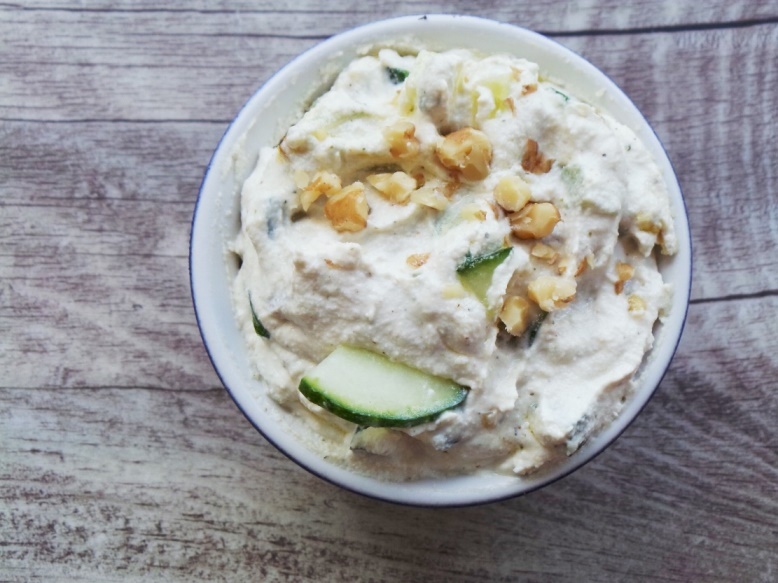 You might say tzatziki is not a salad, that it’s actually a dip, but to me it will always be a salad: we’ve always been eating it in huge amounts at home. 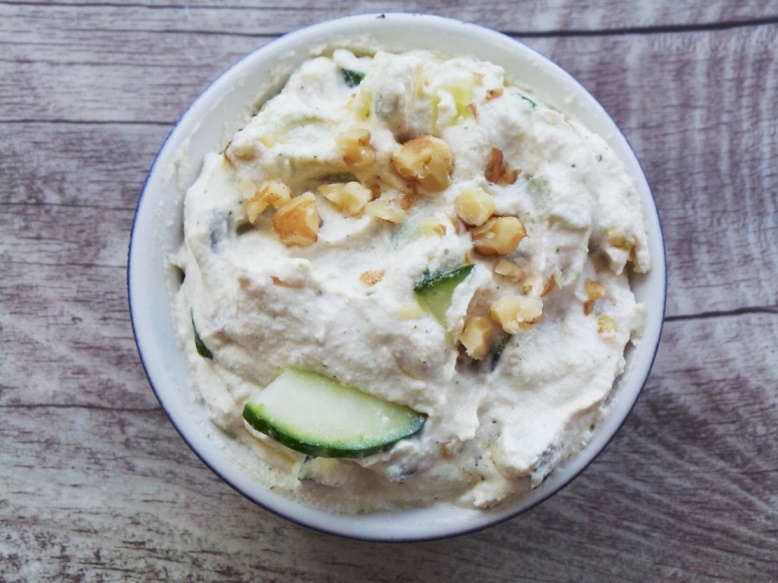 Tzatziki is easy, quick and so good that it makes you forget you smell like you’ve swum in a sea of garlic for lunch/dinner/breakfast. If you don’t want to smell like garlic, but want to drown your face in tzatziki today, you can do this: Add a little garlic flavor by letting a smashed garlic clove in olive oil for around 30 minutes, then remove the garlic, before you add the oil to the rest of the ingredients. This would remove that pungent, yet mesmerizing garlic smell. But there’s really no fun in that. The best tzatzki(s) I have ever had are made with really thick strained yogurt, almost like cream cheese. You can add it to anything you want – any cooked meal and it’s amazing in any kind of wrap or with falafels, vegetable burgers… anything. Everything gets better with a little tzatziki. The easier and quicker version is to use yogurt. That’s not great if you’re vegan, dairy-free or paleo and just have to stand by and watch while everyone is devouring that tzatziki going mmmmmmmmmm. It would be like being sober while everyone else is drunk. You just wanna punch them to sleep. Now because I truly, like a Miss Universe, care about World Peace, I came up with an amazing vegan version. This version is also paleo, dairy-and gluten-free and everyone will love it! 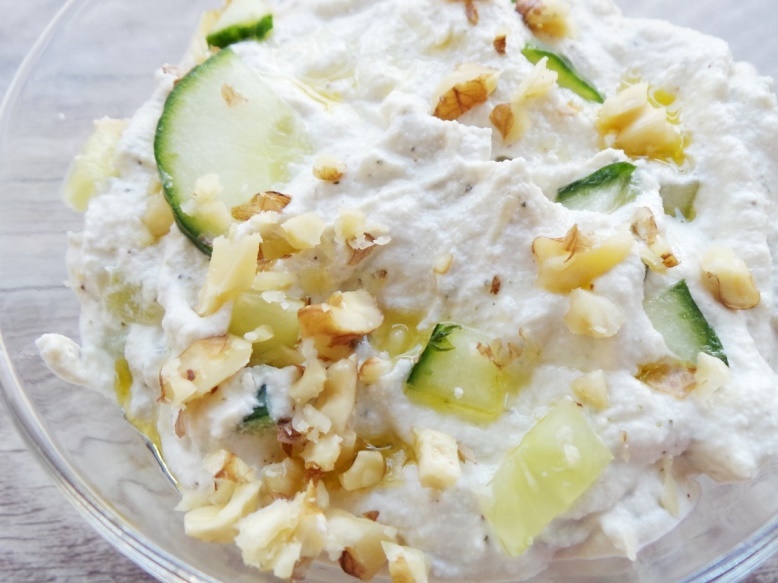 It needs a little more preparation than yogurt tzatziki that is made in 5 minutes. You’ll have to be very patient and soak cashews overnight to then make your vegan cream cheese out of those the next day. But it is worth it. 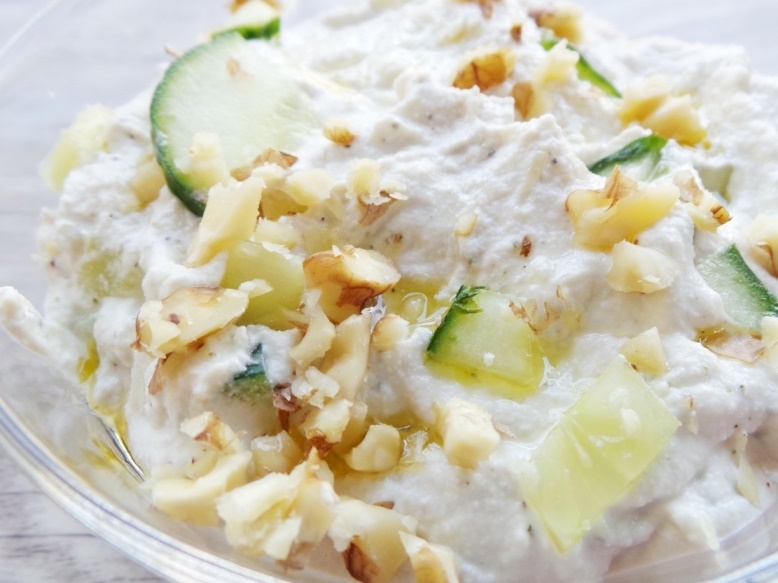 The vegan tzatziki is slightly sweeter than yogurt based tzatziki, because cashews are kinda sweet, but the sweetness did not bother me at all. The tzatziki gets better with time (like women and wine). Keep it in the fridge up until three days. The cucumbers do let some water out, but all you need to do is mix well, so that the “cream cheese” and water combine and everything gets creamy again. Both versions – vegan and non-vegan are surprise surprise!! good for you! Thanks to garlic you can help your liver detoxify your body quicker, you can lower your blood pressure, fight bacteria, viruses and all those evil monsters. Cucumber hydrates and contains like all fruits and vegetables antioxidants that help you prevent oxidative stress and thus diseases and aging in general. Yogurt is rich in Calcium and in probiotics, that are both good for your skin. And if you go for the vegan/paleo version: cashews like all nuts are heart healthy, prevent cancer and help you lose some weight. And with so much lemon juice, the vegan tzatziki is also bursting with collagen-building vitamin C to keep your skin forever young. You see, whichever version you prefer it’s good for you. In a food processor combine cashews, olive oil, lemon juice, salt, white pepper, majoram, garlic cloves. If you don’t want to smell too much like garlic infuse some olive oil with garlic by crushing the garlic clove, and letting it sit in the olive oil for 30 minutes. Then remove garlic and add infused olive oil to the rest of the ingredients. Process until smooth at low speed. It should get creamy – add water one tbsp. at a time. Mine took 6 tbsp. When the “yogurt” is ready transfer to a small bowl. Dice cucumbers and add them to the vegan yogurt. Add salt to taste, I needed about ½ tsp. 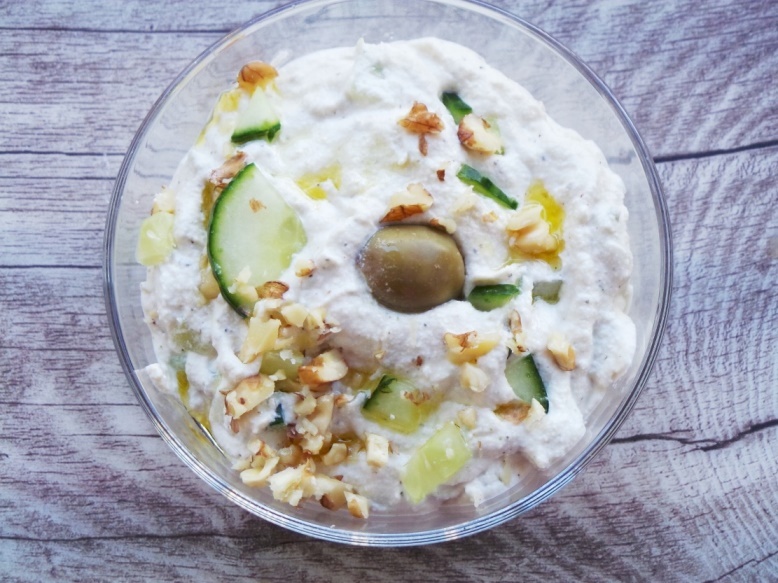 Optionally you can add more dill, it will give the tzatziki even more freshness. Garnish with ground/chopped nuts or sesame seeds. And now for the quicker, regular version that uses strained yogurt. Stir yogurt well with a fork in a small bowl (for dips), so it gets very creamy. Add olive oil. As mentioned, if you don’t want to smell too much like garlic infuse some olive oil with garlic by crushing the garlic clove, and letting it sit in the olive oil for 30 minutes. If you don’t care (I like your style) – press and add the garlic afterwards. Combine well until smooth. Dice cucumber into small pieces. Add to the rest of the ingredients. Combine and garnish with walnuts or sesame seeds. Hope you make either one of these versions, or both of them! Let me know how it goes! I’m not sure what kind of yogurt to use for this recipe. My go-to plain yogurt is Fage 2% Greek yogurt. Would that work? 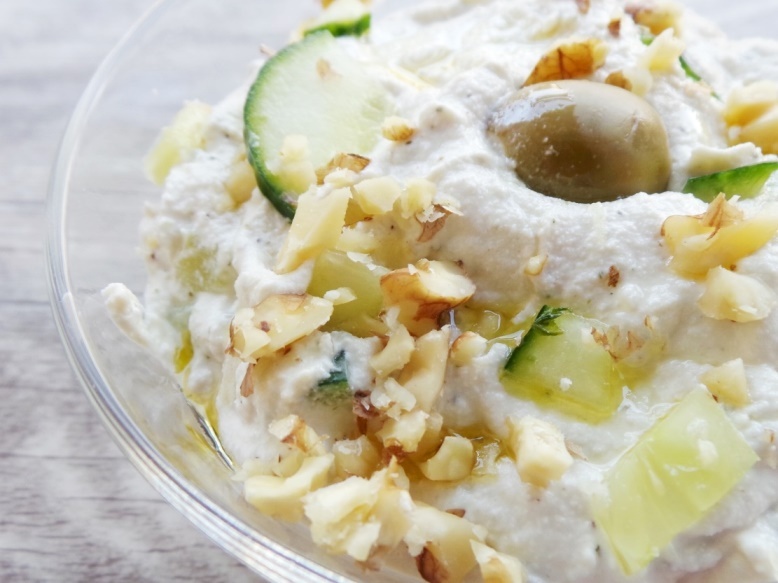 Any type of yogurt can work, but if you use a lower-fat one the Tzatziki will be a little thinner. I usually go with whatever I have at the moment, but the best versions that I’ve had were made with thick, strained yogurt. Hi, what do you soak the cashews in overnight?